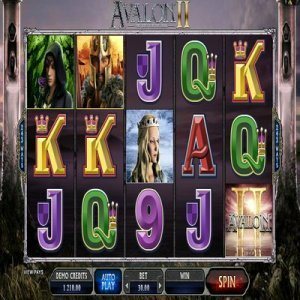 I’ve been a fan of the first Avalon slot machine game so I was excited, but concerned, when the ompany announced Avalon II. It’s been my experience in the slot machine world that many sequels to popular games fail to improve upon the original game but I was still willing to try it. Avalon II is designed to appeal to people who want to bet small amounts. It’s definitely not a high roller game. I am a fan of the more high roller games, because, I want to obviously win as much as possible. However, I appreciate the option of having a small risk opportunity. Sometimes, I just want to play for a little bit. One of the best aspects of the Avalon II Slot machine game is the intense graphics and the fact that there is an actual storyline to follow. It’s based on the story of Arthur and his guest for the holy grail. The story plays in the background and the characters come to life and interact with you while you play. I enjoyed this and found it to be a good diversion. There’s also a bunch of bonus levels which are relatively easy to get to. I really like the bonus levels feature. One of the main reasons I love to play games is because they are exciting and allow me to level up quickly. There’s a lot of triggers during the game that open up the bonus levels and once you are done with the bonus levels, the game lets you go back to the regular level. A lot of the bonus levels allow you to win free spins, which is always nice. There’s even a bonus level that has a free spinning wheel. This game is perfect for people who liked the original Avalon game. It basically takes many of the features of the old game and expands them so there’s many more ways to win with live play. While playing it, I found I won and received payouts many times. This is definitely a high playout slot machine although the amounts are not as high as some people may wish. All in all, this is a good game especially for people who are new to the slot playing world or are looking for low risk games. There might not be enough here for high rollers to feel satisfied but other than that, Avalon II is a lot of fun.